Circumstances: Rebecca may be in the company of her mother. They may still be in the local area or they may travel to The Bahamas. Rebecca's nickname is Becky. Rebecca is still listed as missing. Thare are no updates available at this time. Rebecca was 3 years old when she went missing. She would be 4 Years old now. It is believed that Rebecca is in the company of her mother Dedrie Andrews, pictured below. Circumstances: Rebecca was allegedly abducted by her mother, Dedrie Andrews. A felony warrant is on file for Dedrie. They may still be in the local area or they may travel to The Bahamas. Rebecca's nickname is Becky. Rebecca would be 5 years old now. 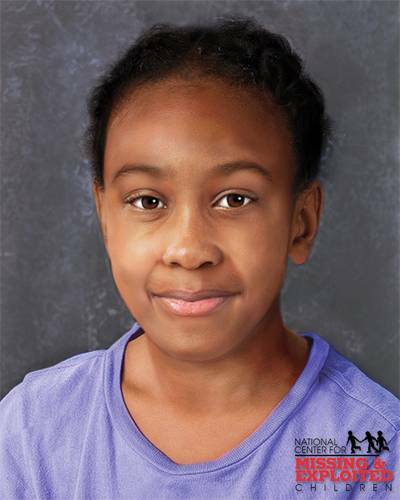 Rebecca's photo is shown age-progressed to 5 years. Rebecca is still listed as missing..
She has been missing just over 3 years..
She would be 6 years old now..